I'm Tamarah, the brain behind this amazing mess of a blog. I am currently working as a librarian in a small town library in the Wichita metro area; I work with all age groups, but primarily cover the young adult/new adult sector and construct a large portion of our paperwork for summer reading. I received my Associate of Arts in Communications from Hutchinson Community College in 2010, and a Bachelor of Arts in English Literature from Wichita State University in 2016. Though I have toyed with the idea of going to grad school, there aren't any current plans to do so. I have enough student loan debt to last me a while, I think! Before I was a librarian, I worked as a professional cake decorator/bakery manager; I trained at the Eric Fisher Academy in 2011 in their Esthetics program and, though I didn't follow that career path, I have worked as a freelance makeup artist ever since. I do as much traveling as my budget will allow in my free time, and I enjoy photography and writing as a side hobby. 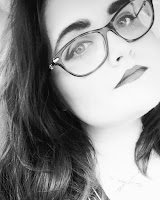 I started this blog in 2017 as a way to flex my writing muscle and cope with anxiety and depression - something I may discuss more in detail at a later date, I'm not sure. For now, I'm happy to discuss what I'm reading, what I'm doing, and I plan to expand into music and lifestyle stuff down the road; really, I'd just like to get some sort of schedule in place. If you'd like to contact me, there should be a form down below to fill out and send on to me, but please feel free to comment on any of my posts and contribute to the conversation. I'd like for this to be as much about you guys as it is about me, so if there's something you want to see or know, just let me know and I'll do what I can!